After delivering super hits like ‘Padman’, ‘Gold’ etc, Bollywood star Akshay Kumar is all set with a patriotic film, ‘Kesari’. Despite being one of the fiercest battles ever, the Battle of Saragarhi is lost somewhere in history. Akshay Kumar joined hands with director Anurag Singh to narrate us the story of 21 Sikh soldiers fighting against 10,000 Afghan troops. The film is undoubtedly one of the much-anticipated movies in Bollywood which finally made it into the theatres today on March 21st, 2019. Let’s check out the review of the film. On September 12, 1897, the Afghan soldiers tried to capture Saragarhi, which is actually like a signaling post between Fort Gulistan and Fort Lockhart. Afghan soldiers tried to cut off all the communication between the two forts. Though the ammunition is extremely low and there are no proper reinforcements, 21 soldiers from the 36th Sikh Regiment of the British Indian Army headed by Havildar Ishar Singh (Akshay Kumar) decides to go against them and kickstarts a fierce battle. The movie also showcases the lives of some soldiers among which one soldier is away from his six-month-old daughter, another has been facing caste discrimination all his life etc. Akshay Kumar is undoubtedly the star of the show. He is the major driving factor in the film. His outstanding performance will definitely strike a chord with the audience. His body language, his mesmerizing dialogue delivery, and his power-packed performance will give an absolute eye feast for the fans. He actually went under the skin of the character and delivered a fierce and fantastic performance. Parineeti Chopra played the wife role of Akshay Kumar but barely appears on the screen. Despite having less scope for performance, Parineeti justified her role and delivered her best performance. The rest of the cast also did their best. Director Anurag Singh has portrayed the story in an easily understandable way. He has not only dared enough to tell us the story of the unsung hero Havildar Ishar Singh but also portrayed it in an extremely beautiful way. Especially, the war sequences came out really well. The production values are absolutely very high and the producers have invested decent amounts and haven’t compromised in terms of quality. Music is also good. The background music is commendable. Especially, in the war sequences, the music will definitely engage the audience. The cinematography is amazing. The camera angles and the visuals came out really well. Editing is clean. As most of the people don’t know about Saragarhi battle the audience will be engaged and will keep guessing about what is going to happen next. Akshay Kumar’s stupendous performance is definitely the highlight of the film and ‘Kesari’ is a one-man show. 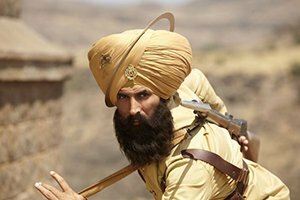 At times, ‘Kesari’ has some light moments followed by some intense battlefield sequences. Though the makers tried to build a story based on the real events, they also gave a disclaimer that they have added some fictional elements as well which can be considered as a negative point. Anurag Singh’s narration is good but there are some scenes in which we can sense the lack of logic also became a minus point. Overall, ‘Kesari’ is worth watching.